Summer has gone and the Autumn is here and although that means it’s getting darker and that little bit chillier this season is great for chickens; It’s not too hot or too cold for them, there’s fallen fruit to be enjoyed and they will love raking through the autumn leaves to find a juicy bug. And while they’re busy in the garden here’s another newsletter for you to enjoy in the comfort of your home, including a very eggciting competition. We had a great response from last month’s Spot the Difference competition. Some of you correctly spotted the 10 differences, some of you didn’t quite make it and a few of you found differences that weren’t really there! It was a great test of patience and eyesight so well done to all of you that were correct, and commiserations to the rest…don’t worry, most at Omlet HQ didn’t get it either! Did you find the 10 differences? Now for an Omlet first, and a very eggciting competition indeed… we are currently making the finishing touches to our 2010 calender. This will be the first ever Omlet calender and we are giving you the chance to be a part of it. How would you like to be the star of one of the 12 months of Omlet? Each month will feature one of you – an eglu, cube or beehaus owner. We are looking for people that keep chickens, rabbits, guinea pigs, ducks, quail, bees…or whatever else you might keep in your eglu! And if we choose to feature you not only will you be a sensational star but we will send you a copy of the calender. We’ll even sign it for you if you like, although you may be signing copies yourself for friends and family. We know it’s a bit early to be thinking about next year already, but some shops have been selling 2010 calenders since August! And as we are currently producing our first ever Omlet calender (in case we didn’t already mention that) we want to let you all know early to avoid disappointment. With cool cartoons, dates to remember, funny photos and top tips the must have item of 2010 will be available in October but you can let us know now if you would be interested in buying one by emailing stephanie@omlet.co.uk – just put “I like to keep up to date” – in the subject line. There will be limited stock so tell us now to avoid disappointment. Last week turned out to be very exciting for some keen Beehaus owners and it was pretty exciting for us too. Now, Omlet are pros at delivering our good old girls the Gingernut Rangers and Miss Pepperpots but this time Johannes had the task of making a rather special delivery. They fly, they lay eggs but their not chickens…yes the Omlet delivery van was full of bees! Excited customers waited all over the country for the arrival of their new beehausmates and they weren’t disappointed. The bees loved their new homes and after having a Winter break they will be busy pollinating plants, collecting nectar and making lots of yummy honey. Hoorah! The new bee courses are proving to be really popular with people new to beekeeping. These courses give beginners the guidance they need to get started with this fascinating hobby and they offer the perfect chance to see if you can handle the buzz. With the yolk from your softboiled egg and these four colourful eggcups you’ll have a whole rainbow on your breakfast table. Now if that doesn’t brighten up your morning what will?! Four solid melamine eggcups in pink, orange, red and yellow. Maybe it’s just me but isn’t this year speeding past? Summer had a final fling last week but there’s a real nip in the air when I get up to let the hens out each morning now and in the garden, the leaves are beginning to turn on the trees and the apples, pears and plums are almost over. It’s been a funny old summer. Not quite the heat wave “barbecue summer” we were promised but at least it hasn’t been the washout last year was! The egg situation has been a bit hit and miss thanks to a couple of broody hens becoming all hormonal in that lovely hot spell in early June and now we have one hen after another moulting feathers all over the garden and that really takes its toll on egg production. Fortunately, we’ve still had enough for Tom to barter with for any fruit and vegetables we’re unable to grow at home which is always a bonus. I wonder whether we could barter all the feathers for something?! The run is absolutely full of them! We have been really lucky in the garden because the vegetables and fruits have done amazingly well this year and we have spent more time in the kitchen making jams, chutneys and fruity tipples ready to store away for winter this year than most others. The hens have done very well from the vegetable garden too with cabbages, wasp bitten plums, partially slugged tomatoes and bolted lettuce and they have wolfed down everything they’ve been given with gusto! I managed to sneak in a few extra rows of cabbages especially for the chickens so that we don’t have to buy them from the market for a few months. As the hens spend much of their time in the large run where they are safe if we aren’t at home during the day, this means that they don’t have access to grass as much as they would like so giving them a nice fresh cabbage makes up for this and provides them with the vitamin C they need. Your name and age: Peta Stanley, 41. Where do you live? Aynho, Nr Banbury. Live with my husband Nick, Golden Labrador Jack, Bengal Cat Egli and my 6 lovely chickens. What pets do you have? Chickens, 1 Bengal Cat, 1 Golden Labrador and lots of fish. If you were stranded on a desert island what luxury item would you have? An Eglu Cube full of chickens! Spring, everything is new and fresh, the colours are vivid and the nights start drawing out. What is the most daring thing you have ever done? Absailed, the scariest bit was the beginning bit going over the edge. I was petrified, but so thrilled when I did it and was back on solid ground. Who would play you in a movie of your life?m Lisa Kudrow (Phoebe from Friends). What song do you most like dancing to? Slow dance, anything by Gabrielle (80’s stuff). Silly dance, has to be the Birdie Song doesn’t it?! Peta loves to pamper her pets! What are your chickens called? Aggie, Chuffa, Dot, Dash, Emily and Fred. How many eggs do you get a week and what is your favourite way of cooking them? Approx 36, boiled or poached for breakfast or hard boiled in a sandwich. Do you bake more cakes now you have your own chickens? No, I’m not one for cooking, but all my family and friends love the eggs and bake for me which is much better! Do your chickens have a party trick? Chasing the cat! What do your chickens like eating more than anything else? Mealworms, they just can’t get enough of them, and they are rather partial to spaghetti. What’s been the most surprising thing about keeping chickens? How friendly they are and how comical they are to watch. Can you imagine life without chickens? No not at all. Never really thought about chickens much until I got mine, but now I just love spending time with them, pampering to their every need and basically chilling out with them in the orchard. I would love to get more chickens soon, maybe some battery hens to give them a new, well deserved start to life as it should be! Have you ever sat down for breakfast, taken the top off your boiled egg and gone in for the dip before realising you forgot the seasoning? By the time you’ve gone into the kitchen and located the shakers all sorts of events could have taken place; the yolk’s set, the soldiers are cold, or, worse, some greedy trespasser has gobbled it! You need to ensure you are prepared for all possibilities! This may look like a normal egg cup, but the base holds a special secret – salt. As long as you keep it filled you will never again need to abandon your egg to find the seasoning. When friends pop round for tea it is nice to serve them something really special and a gorgeous teapot makes all the difference. Made from fine bone china and with a beeauty of a bumble bee print, this is a splendid teapot that will get the conversation buzzing. Sourced and made in potteries in Stoke on Trent it is of lovely quality and would make a gorgeous gift for someone else or a treat for yourself, and it is completely safe to use in the dishwasher. Matching items are available so you can put on a tea party to impress! Has a capacity of 660ml. Comes packaged in a gift box. Every gardener needs a good fork, and this one ticks all the boxes. The ashwood handle looks smart and is smooth to hold, and the stainless steel fork is strong and hard wearing. It even has a loop so that you can hang it up after use. A brilliant tool that will last you ages! Attract some fascinating wildlife to your garden with this tasty, tempting food. With black sunflowers, kibbled maize and yellow millet this is a varied food that wild birds, such as robins, woodpeckers and collared doves, will love. Just pour into a seed feeder or sprinkle on a bird table regularly. A woman in Buffalo has just held a welcome party for her chickens after a year of being without them. Monique Watts lost her hens Buttercup, Minnie, Meg, Tilda and Mama Effie a year ago after someone had reported her for keeping them illegally. She hadn’t realised that there had been a recent city ordinance banning residents from owning chickens. Monique started keeping chickens in her backyard as she was conscious of where her food came from. She was upset to have them taken away from her and decided to fight for a change in law and to get her pets back. With the help of her councilman she managed to get a new ordinance passed allowing residents of Buffalo to keep up to five chickens as long as their neighbours agree to it. After welcoming her hens back Monique plans to continue her fight as she believes the ordinance is still restrictive. She believes that everyone deserves to have fresh eggs and she wants keeping hens to be completely legalized. And if you live in Buffalo, or anywhere else in the USA you can buy an eglu for your backyard. Click below to visit the online shop! Monique’s hens are happy to be home. Kids are back to school this week, the holiday season is coming to an end, and before you know it the shops will be putting up their Christmas decorations and you’ll be running around like a headless chicken again. So enjoy the peace while it lasts. It is a great time for your chickens as they will be enjoying the last of the fallen summer fruit and the temperature is a little cooler for them to handle. It’s not too late to plant some salad as our veggie guru explains, and there’s still time for a picnic or two with Tom’s recipe for the ultimate egg sandwich. So there’s lots of celebrate in September! You’ve heard of flipping pancakes before but have you ever heard of a flying omelette? No, neither had we, until a customer of ours got in touch. Jamie Campbell, proud eglu owner has just been paragliding in Slovakia, and what better attire to wear during his flight than an Omlet tshirt? We’ve seen the forum thread of Omlet tshirts around the world, but this one is very impressive. So if you’ve bungee jumping, sky diving or absailing in one of our tees send us in a pic to stephanie@omlet.co.uk. 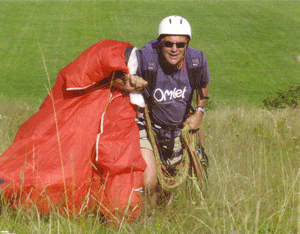 Jamie thinks paragliding is eggsilarating! Nothing brightens a rainy day like a display of colourful flowers, a giant marrow or two and some tasty, organic food. So instead of hiding in your house this weekend why not come and join us at the Bath and West Gardening Show. There is lots to see and some great things to buy, and it makes a fun day for all the family. We will be on stand 158, in the main square, so if you’re thinking about keeping chickens in your back garden you can come and have a chat. Visit the website for more information. Now that’s what you call fowl behaviour. 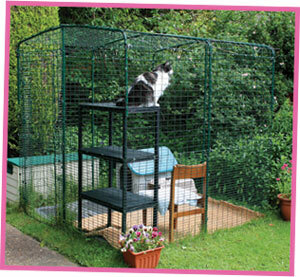 Although the chicken hynotiser has been locked up you can never be too careful! Now that the holidays are over September is the perfect month to go on a course and learn all about keeping chickens. Hen parties are run all over Britain, from Edinburgh to Portsmouth so there is probably one nearer to you than you think. Our courses are a great opportunity for you to see an eglu or cube, to learn about looking after your hens and to eggsperience a chicken cuddle or two. And if it is bees you’re interested in we have a range of courses for you aswell! It is a great idea to go on a course before deciding to keep bees to learn all the basic skills you’ll need and to give you confidence in handling a brood. Alternatively, if you would like to become a course host please email johannes@omlet.co.uk. We’ve already received lots of entries for this month’s Spot the Difference competition, and there’s been an interesting bunch of answers so far…but don’t worry if you missed the last newsletter (or if you’ve been staring at the screen for the past week) because you have until next Thursday to enter. Click here to see two images taken at the Beehaus launch. There are 10 differences, some of which are more obvious than others. When you think you’ve spotted them all send your answers to stephanie@omlet.co.uk. You can either send the image with circled ‘spots’ or write as a list. Good cluck and we apologise if you spend your entire weekend searching for answers. Although it’s coming towards the end of summer it’s not too late for going on a picnic to make the most of being outdoors. The hens are still laying whoppers and the salad is doing really well, and picking the salad leaves when small, means that you can continue picking for weeks. So what better way to make the most of all this fresh salad and eggs than by making the ultimate egg sandwich – perfect for packing up for those final picnics. 1) Mash the egg with the mayonnaise, onion, tomato and paprika, season to taste. 2) Fill a large wholemeal pitta bread with salad leaves and top with the egg mix. Et voila – It’s so easy beezy you have no eggscuses! This beats a sarnie from Tesco any day! I love salad leaves. From the humble butterhead lettuce to the mustardy Mizuna leaves. They all have their own specific tastes and textures. Mixing them all up into one big bowl of salad with a yummy dressing is my idea of heaven in this warm weather. The nice thing about salad leaves and lettuces is they’re the easiest and quickest of all produce to grow. In fact if you’ve never grown anything before these are best seeds to start with and you can do it right now…or once you’ve finished reading the newsletter. There are various types of lettuces and the terminology can be confusing but you see them all at the supermarket. Cos, butterhead, romaine, loose leaf. Sowing lettuce seeds is really simple and can be done by anyone and into practically anything. I grow mine in grow bags but you can use a window box, plant pots, ice cream tubs or any patch of ground you have bare. All you need is some soil or compost, your chosen seed(s) and water. – Fill your receptacle with soil and firm down gently. You want to form a crumbly but firm bed. – Sprinkle your seed sparingly across the surface of the soil. A few seeds go a long way. If you’re growing varieties that grow into heads of lettuce leave more space between each seed than cut and come again varieties. – Cover the seed with a fine dusting of soil just a few mm deep. In just a few days you will see the seeds germinate. Keep them well watered and within 2 or 3 weeks you’ll be enjoying your very own home grown lettuces to eat in your lunch box or sunny picnic. If you want to vary the flavours in your salad why not try some unusual leaves such as Rocket, Mizuna or mustard leaf. They all just as easy to grow but add amazing flavours.If you have two batches of lettuces sown two weeks apart you can enjoy one whilst the other grows and then re-sow into the first pot whilst you’re eating the second batch. You should never run out of lettuce leaves! It’s not just salad leaves that make a tasty salad. In my garden I’m growing some lovely summer treats. Peppers, tomatoes and cucumbers. Sadly, it’s too late to grow these from seed but most garden centres have ready grown plants for you to grow on at home. They’re really simple to care for too. They do need watering well during the heat of summer and adding some simple tomato feed to their water once a week will help their fruiting. You can grow most varieties outdoors too. Once they’ve started to flower bees and other pollinating insects will help to create your fruit. If you find the flowers are dying but there’s no fruit behind them it may be worth misting them with water or using a small paintbrush to brush over each of the flowers and transfer pollen manually like a bee would. I hope, if you’ve never planted anything before you’ll give salads a go. They’re healthy, tasty and could be right on your doorstep. Where and with who do you live? Manchester with Diana, Rebecca, Joel and Anouchka. How long have you been keeping bees? 11 years. What made you decide to keep bees? As part of being self suffiencent, and because they’re fun. How many bee hives do you have? Five. What plants in your garden do your bees like the most? It depends on the time of the year – at the moment it’s lavender, the rest of the time it’s nasturtum. What is your favourite thing about the Beehaus? It can be used in different ways. What do you like doing when you’re not hosting beekeeping courses? I’m busy writing, pottering in the garden and looking after the hens. How long have you been running the bee courses? One year. What made you decide to teach others about beekeeping? As part of my work with Manchester Council encouraging people to grow their own food. We’re putting bees on allotments sponsored by the CO-Operative. Next year we’re going to do the same in London. Beginners beekeeping: You will get an introduction to bees and look at the various tasks a beekeeper needs to master. You will learn how to use a bee suit, smoker, and hive tool, how to open a hive and remove frames and how to find the queen and recognise brood and honey. And you’ll be able to see the world famous Beehaus up close and personal! Beginners beekeeping theory: You will receive a copy of the book Keeping Bees: A Complete Practical Guide by Paul Peacock. You will learn about the bee year and the importance of varroa and disease control, about the castes of the bee, their functions and life cycles and about swarming. Have there been any course disasters? I think one pupil killed a queen – just sorting this out. What’s the best thing about being a course host? It’s fun and good to interact with like-minded people. Why should people attend a course? There is no better way of finding out if it’s for you. It’s cheap and fun. This season white is the new black. new black last season too! Have you ever sliced a hard boiled egg for your sarnie only to discover it’s a challenge to cover the bread perfectly? A bit of sandwich with no filling is very disappointing so you need to make sure you get full coverage. Well help is at hand with the egg cuber. Yes, we know it sounds a bit wierd and you’re probably asking yourself why eggsactly you would want a cube shaped egg, but just think – perfect square slices with straight edges that fit into corners. Just hard boil your egg as you normally would, remove the shell and pop it into this gadget. Place the square of plastic on top and screw the lid on gently, as it compacts the egg into the cube chamber. Leave for a few minutes, preferably in the fridge, then remove your amazing egg cube. If you’ve got orders flying in for free range eggs from here, there and everywhere you will need somewhere to note them down so you don’t get muddled. This wooden chalkboard chicken is just the ticket for tallying your egg production and sales and it will look great in your kitchen. And if you’d rather make the most of your eggs by doing some baking a la Delia, you can note down all the ingredients you’ll need so that you don’t forget. At approx 30cm this is a decent size chicken to cover in chalk and the rafia string makes hanging it up a doddle. Give it pride of place but don’t be surprised if your hens get jealous when they see it in the kitchen while they’re stuck outside. Every household needs a hook…or four (because one’s never enough). They save the house from becoming a dumping ground for coats, keys and handbags and they create a bit of good old fashioned order. Have you ever wondered what your floor would look like without the existence of the all mighty hook? These handy hooks are perfect for all your hanging needs. Whether it’s coats in the cloakroom, keys in the kitchen or bananas in the bedroom (in case you get peckish in the night), they will not let you down. 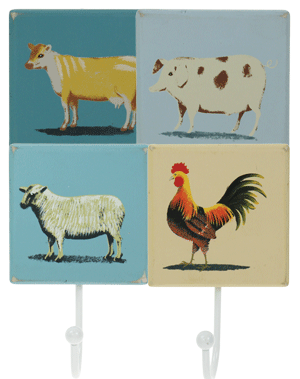 Made from wood and each one handpainted with a farm animal they are perfectly suited for every chicken keeper and they look much more colourful than those horrible big brass things. Don’t you agree? 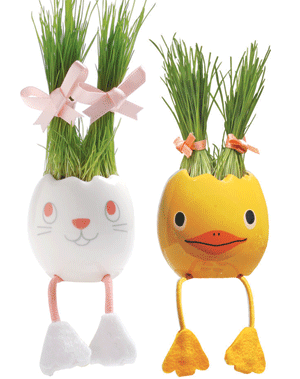 Fresh from Japan, the Nyokki egg pet plant is a cool little creature that will live and grow wherever you like. The handmade, glazed ceramic egg is painted to look like a chick, and its dangly, fabric legs will happily hang over the edge of a table or windowsill. The inside is filled with growing medium and rye grass seeds, which will grow into a lovely head of grass hair within a couple of weeks. When the hair has grown the fun begins, as you get to act like Charles Worthington and cut and style its barnet to your heart’s content. Tie it up, trim it and cut it into funky shapes…a great boredom buster for adults and children alike. The grass will grow back, time and time again, giving you weeks of fun, and when you are finished with it you can use your egg pet to hold bits and pieces. 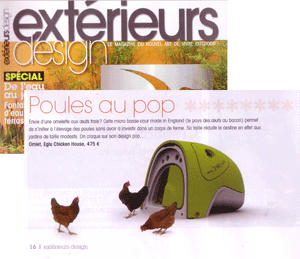 This month the eglu has featured in the French magazine Exterieur Design. Although lots of you living in France already own an eglu it keeps on popping up in magazines as a new and cool way to keep chickens. According to the mag the eglu is made ‘in the country of egg and bacon’ and they say it’s the perfect size for an urban garden and for starting your own little farm. 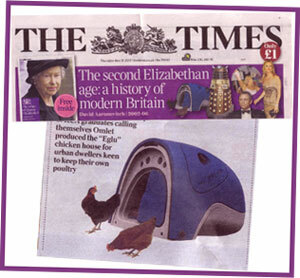 They love the eglu’s ‘pop design’ and it appears amongst a selection of other cool, new techy products. So if you live in France and you also fancy keeping chickens, so you can start breakfasting like the British every day, you can buy an eglu too.